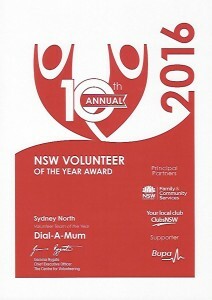 Dial-a-Mum is an organisation of professionally training volunteers who offer support understanding and a friendly ear. We are the mum to the community and are there to offer empathy and understanding for those who are upset, worried or lonely and just want to talk to a mum. Calls are confidential. We do not judge. We do not ask for personal information. We do not promise to solve problems. It is surprising how nice it is to be heard by someone who is prepared to listen. All training is provided. Fortnightly professional development workshops are held. Calls are taken from your own home. Shifts are once a week for 4 hours. You can choose your own shifts. Members of Dial-a-Mum enjoy satisfaction, friendship, personal growth and educational opportunities for self and indirectly for family and friends with their increased knowledge and awareness of community needs. Training courses will be held every February, May, August and October. Please quote in application: Telephone Support Volunteer via Pro Bono Australia.